Chef Salad ($4.25), with blue cheese and balsamic vinaigrette. We enjoyed this mixed green salad with cucumbers, tomatoes, onion, ham and homemade dressings. I always like a bit of salad with dinner, and this was a pleasing dinner salad. Minestrone soup (around $2.19 for a cup). This homemade soup had a good mix of vegetables, pasta and bacon. Meatball sub ($6.25 and served with chips). My dad is a fan of meatball subs and said So Italian’s meatball sub was quite tasty. I didn’t get a chance to taste it — but doesn’t it look good! 12” pepperoni pizza ($7.99 with cheese and $1 per topping). I feel it’s my duty to try as many slices of pizza as I can. 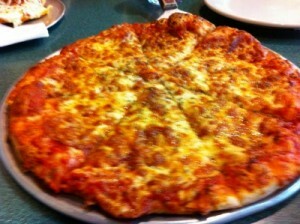 I enjoyed So Italian’s pizza with its thin, homemade crust, tangy sauce and a nice mix of cheeses. It hit the spot. We had plenty of food for the three of us and even enough pizza leftover so that I could enjoy it for lunch the next day. By the time we finished our dinner, the restaurant was completely packed. There are definitely a lot of So Italian fans out there. I’m looking forward to my next visit to try one of the pasta dishes or maybe a calzone. I can’t decide. If you’re looking to try one of the family-friendly Italian restaurants in Hendricks County — keep So Italian on your list. Hours: 11 a.m.-9 p.m., Monday through Saturday; Closed Sunday. What’s on the menu: So much! Appetizers, salads, soups, sandwiches, pastas, pizzas, calzones and desserts. Tips: So Italian is family-friendly so don’t forget to bring the kids. It’s a popular Brownsburg restaurant so get there early. It gets crowded early. Carryout: Too busy to dine in? No worries, you can get your Italian meal to go. Dining outside: I think it’s fun to dine outdoors, and I can’t wait until it warms up so I can sit at one of the outdoor tables in front of So Italian. 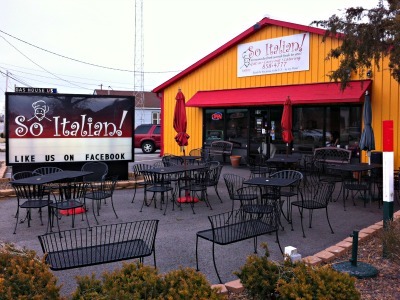 If you’ve been to So Italian before I’d love to hear your thoughts. What’s your favorite thing there? Leave a note in the comments!